As a division of Oak Bay Marine Group, we offer our annual moorage customers exclusive access to all 4 of our Island Marinas! Ask us about our Reciprocal Moorage Program and enjoy 4 marinas for the price of one. 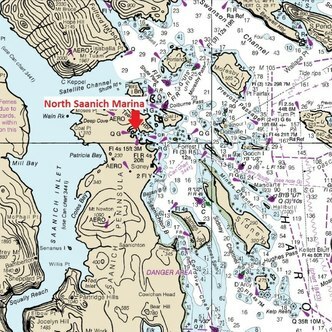 North Saanich Marina welcomes both annual and visiting moorage year-round at our well-maintained docks. Moorage for vessels up to 70 feet is available, with water, 15 or 50 amp power and lots of free parking for your vehicle. Daily moorage is $1.60 per foot. Annual moorage is dependent on the size of your boat. If you’re looking to keep your boat secure near Victoria please contact us for current rates and availability. All moorage rates are subject to 5% GST. Interested in purchasing a boat of your own? Contact our friends at Bayview Yachts Sales and Service, or visit them in person at North Saanich Marina. Our fuel dock features competitive prices and friendly and attentive staff to assist you in docking your boat. You will also find ice, oil, snacks, boat cleaning products and tackle for sale right at the fuel dock. Thank you for your continued business with the Oak Bay Marine Group. As passionate boaters ourselves, we know how valuable your boat is to you. So, we are very honoured that you’ve chosen to leave it in our care. We’d like your feedback. As we strive to deliver the best moorage experience possible, we ask that you take 5-10 minutes to fill out the survey below. Your feedback is extremely important to us and may influence some important business decisions moving forward. Thank you in advance for your responses – we look forward to your reply.